How Ayurvedic Centre And Spa Transforms You In And Out! Since times immemorial, Ayurveda has been India’s time tested remedial and restorative healthcare arena for balancing the mind, body and spirit. Nowadays it is evident that the modern lifestyles, increased stress and other diet as well as lifestyle repercussions tend to cause imbalance in the bio energetic forces in the human body and thus taking form of so many body and mind diseases. This is where Ayurvedic healing centres and spas come to the rescue and offer long lasting positive, holistic growth and rejuvenation. Ayurveda is the first system of medicine to recognize the concept of individual mind/body types and firmly believes that everyone is born with their own natural balance which influences all aspects of their life, including body structure, emotional makeup and predisposition to illnesses. How Ayurvedic Centres and Spas Can Help? The Ayurvedic centres and Ayurveda spas offer extremely personal and wellness regime identifying a person’s ideal state of balance, offering a holistic treatment using diet, massages, herbs, aromatherapy, music, and meditation to regenerate balance and at the same time heal, cleanse, relax and also revitalize. Based on its core holistic healing pillars of Restore & Relax, Breathe & Meditate, Align & Flow, Strengthen & Balance, and Philosophise & Harmonise, the Ayurvedic centres and spas are uniquely designed to rejuvenate and unwind the human body and soul towards sense of complete tranquillity. We can understand that the five basic elements – space, air, fire, water and earth combine to form the human body, by creating three vital doshas that govern all psycho-physiological functions in the body. When these vital forces are aggravated, the body- mind connection begins to suffer and the disease sets in. At the Ayurvedic centres and spas, the Vaidya or the Ayurvedic physician maps out a structured program of diet, exercise, meditation, according to body type to bring dosha healing (balance), restoring of energy and mental tranquillity. Other than benefiting from its body replenishment qualities, the various Ayurvedic treatments and therapies provided at Ayurveda centre or spa aids principally in providing holistic healing and harmonizing body, mind and spirit altogether. 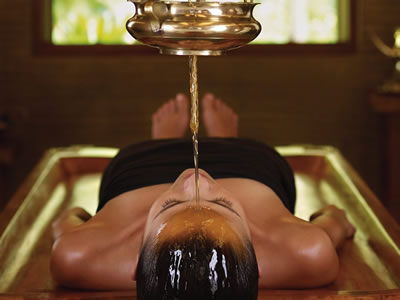 An Ayurveda Spa is known to be an effective management for health as well as beauty. Enhancing Beauty – Ayurvedic centres and Spa procedures integrate the use of herbal scrubs, massage oils and natural pastes and lotions. The proficient use of these products along the therapies offered at Ayurveda spa aids in removing the dead skin from the body giving a polished and glowing complexion. Stress Relief – Rhythmic strokes of the therapeutic products used at the Ayurveda centre or spa relax the stressed body muscles. The oils thus used are believed to be enriching for the skin and also these cast soothing effect onto the entire nervous system. Weight Loss Benefits – An array of Ayurveda therapeutic massage sessions that include friction strokes followed by steam baths, helps in losing weight. Health Benefits – Ayurveda Centre or Spa is a renowned treatment centre for stress, pains and fatigue troubles. Thorough Detox – Panchakarma Ayurvedic treatments for detoxification and balancing of doshas is generally the part and parcel of Ayurvedic centre or spa. Yogic Achievements – Apart from broad-spectrum yoga practices, the reputed Ayurvedic centres and Spas indulge in therapeutic Yoga with integrated approach towards the health issues which involves breathing exercises, yogasanas, special relaxations as well as counselling. Ayurveda inculcates herbal massages to dispel fatigue and enliven the body’s own self-healing mechanism. Ayurvedic treatments like Abhyanga and Shirodhara which are profoundly rejuvenating, health-giving and relaxing use Ayurvedic oil formulations and essential oils. These are powerful ingredients that relax, harmonize and balance the emotions & improve the overall wellbeing and physical health restoration of the individual. Not only this, at Ayurvedic centres we have special massages like ‘Pizhichil’ using a variety of herbal oils, which has proven in curing severe ailments like paralysis and nervous disorders. ‘Abhyanga’ is well known to treat diabetes and obesity. ‘Nasya‘, ‘Snehapana’ and ‘Kizhi’ have been proven medically to treat sports injuries, skin diseases & leukemia. Relating to the basic diseased condition, specialised slow and synchronised massages using less oils, regulating nutrition, customised treatments & aftercare programme are designed at the Ayurvedic centres and Spas under the supervision of Ayurvedic physicians, therapists and yoga experts. The practice and philosophy of Ayurveda is not only to restore balance and ease the aches and pains of the body but also those of the mind as well as the spirit. Meditation forms a major part of the treatment that helps in experiencing inner calm and tranquillity. Today’s accelerated pace of life has led to stress, insomnia, anxiety and chronic health issues and meditation is the most direct way to experience inner silence and wellbeing. It has been proven scientifically that meditation slows the breathing, reduces blood pressure and stress levels. Ayurveda meaning “knowledge of life” is the most ancient system of preventive healthcare for creating balance and strengthening the body’s healing abilities for a life – transforming experience. Is Indian Ayurveda Best Global Healthcare Option?